Kathryn Sullivan, Ph.D., under secretary of commerce for oceans and atmosphere, and NOAA’s administrator at the SeaWeb Seafood Summit in New Orleans released a new NOAA report that identified six nations -- Colombia, Ecuador, Mexico, Nigeria, Nicaragua, and Portugal -- as engaging in illegal, unreported and unregulated fishing (IUU). 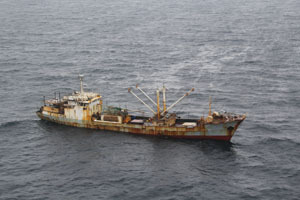 IUU fishing and seafood fraud undermine international efforts to sustainably manage and rebuild fisheries, and creates unfair market competition for fishermen playing by the rules, like those in the United States. The findings are part of the 2015 biennial report to Congress. The SeaWeb Seafood Summit brings together global representatives from the seafood industry with leaders from the conservation community, academia, government, and the media for in-depth discussions, presentations, and networking around the issue of sustainable seafood. The goal of the Summit is to foster dialogue and partnerships that lead to a seafood marketplace that is environmentally, socially, and economically sustainable. Protecting the country’s reputation as a leader in sustainable fishing is at the heart of President Obama’s efforts to combat illegal, unreported, and unregulated fishing and seafood fraud around the world. The report also highlights U.S. findings and analyses of foreign IUU fishing activities and of bycatch of protected species and shark catch on the high seas where nations do not have a regulatory program comparable to the United States. In addition to undermining international fisheries efforts, IUU fishing can also devastate fish populations and their productive marine habitats, threatening global food security and economic stability. Global losses attributable to IUU fishing have been estimated to be between $10 billion and $23 billion annually, undermining the ability to sustainably manage fisheries as well as economic opportunities for U.S. fishermen. The report is a requirement of the High Seas Driftnet Fishing Moratorium Protection Act, as amended by the Magnuson-Stevens Fishery Conservation and Management Reauthorization Act and the Shark Conservation Act.